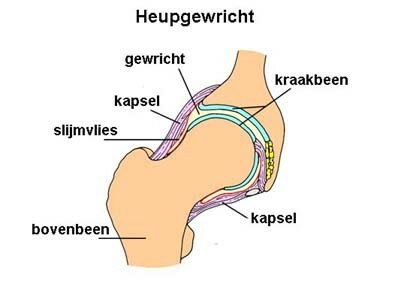 In order to effectively understand a hip joint disorder it is important to know how a normal hip joint is constructed. Different terms and structures that are described below will crop up again in the symptoms/complaints and disorders sections. A joint is a place in the human body where the ends of two bones meet and where movement can occur. The hip joint is described as a ball and socket joint that is made up of the round head of the upper leg (femoral head or caput femoris) and the hip socket (the acetabulum) that is part of the pelvis. 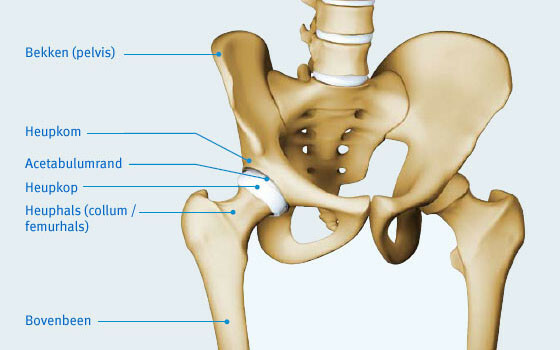 The hip joint is constructed from several layers to produce a stable and functional joint. The deepest layer contains the bone structures with the spherical femoral head (caput femoris) of the upper leg (femur) on the one hand and the hip socket (acetabulum) on the other. The femoral head and the hip socket are covered with a layer of cartilage, which facilitates supple movements between the two and helps them absorb shocks. The labrum is found around the hip socket. This structure gives the hip socket extra depth. The hip socket is connected to the rest of the upper leg by a short neck with a bone projection (the greater trochanter) at the end, to which various important muscles are attached. The greater trochanter is the bone you can feel at the side of the upper leg. The next layer consists of the hip capsule that surrounds the joint and holds the ligaments that provide the joint with stability. 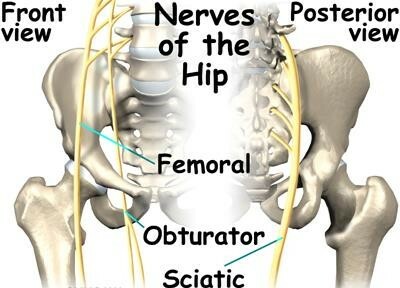 They connect the hip socket to the upper leg. Tendons are structures that connect these muscles to the bone and allow movement. 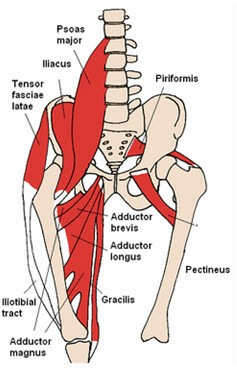 On the outer side of the upper leg is the tensor fascia lata leading to the iliotibiale band. At the rear the three gluteal muscles form the buttocks and provide lateral movement (abduction - away from the body) and backward movement (extension or stretching). They also stabilise the pelvis when walking. Limping could be the result of damage (inflammation or a tear) in these muscles. On the inside are the adductors, which move the leg sideways, inwards. 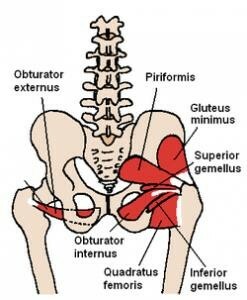 The iliopsoas and the rectus femoris are two muscles that enable us to lift our leg (flexion or bending). There are also exorotators that run from the pelvis to the rear of the upper leg and enable external rotation of the leg (outward rotation of the knee and foot) and play an important role in the dynamic stability of the hip joint. 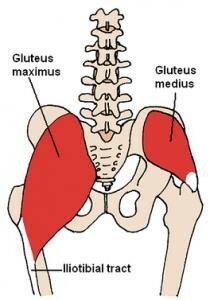 Lastly, at the back there are the hamstrings that help the leg to stretch, together with the gluteal muscles. All nerves between the spinal column and the lower limbs run along the hip joint. The three main ones are the femoral nerve that runs along the front of the upper leg, the obturator nerve on the inside and the sciatic nerve that runs along the rear. The nerves are responsible for controlling the muscles and transmitting information to the brain regarding sensations, spatial awareness and pain. 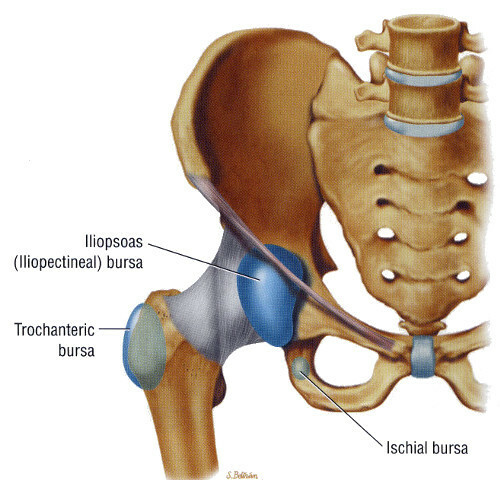 Finally, there are two more important bursae: the trochanteric bursa and the iliopsoas bursa. These bursae are found where friction occurs between bone and tendons. A bursa’s role is to reduce friction between the two structures. When inflamed these structures cause pain.